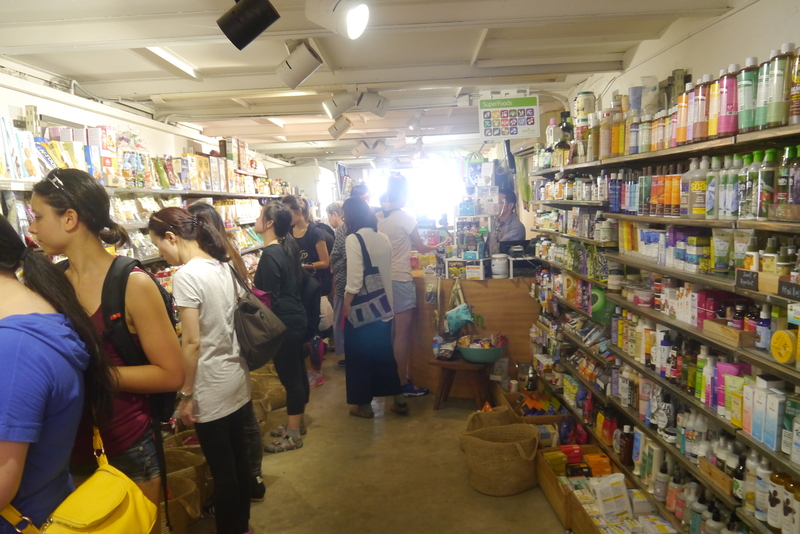 A whirlwind tour of the vegan possibilities on Lamma Island, and a little of Lantau Island, too. 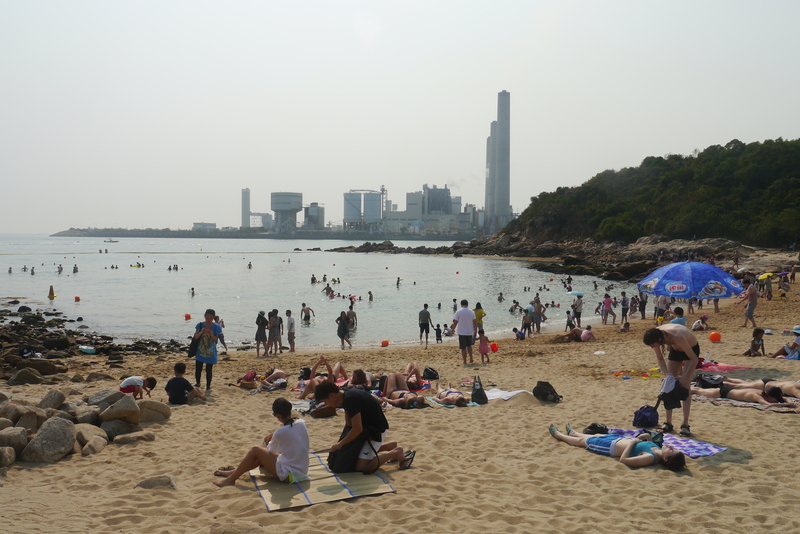 It was a pure coincidence that we decided to go to Lamma Island. Actually we were supposed to go to Macau that day – turns out if you’re trying to get a ferry ticket to and from Macau on a National Holiday, you really do need to book in advance. So we were left, at 10am on a Monday morning, with no plans for that day. What to do? Of course we went to Mana Slow Fast Food and ate (everywhere is closed at 10am on a Monday! ), but after that we really did need some plans. It was a beautiful sunny day, and the beach seemed like the best idea. Back to the ferry, and on to Lamma Island for some exploring. Don’t be put off by the number of seafood places when you arrive, you’ll soon be onto a lovely walking trail that will take you round the island. The beach was a disappointment – it was small, a bit dirty and very crowded – so we headed off to find some find some vegan food. As we neared the little village Yung Shue Wan, we noticed that the shops were becoming decidedly more Western in look, or hipster, or arty, or whichever phrasing gives you an accurate enough impression. Lantau Island, in comparison, is much more what I would expect a small island in Asia to be like, even though it’s far more touristy. Local shops, local food, not much English. At least the parts we went to. Bookworm Cafe We were advised to visit Bookworm Cafe. This was, personally, my biggest disappointment from the whole trip. 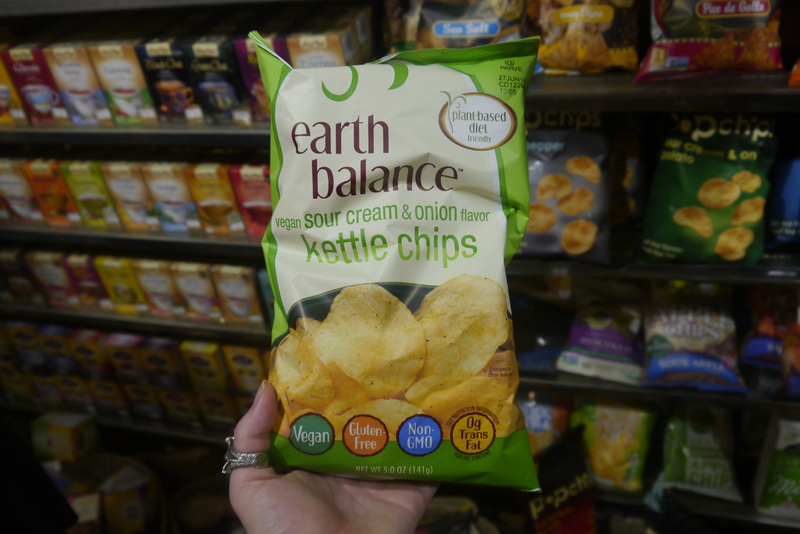 Not only that, but they’re really not vegan suitable, despite being advertised as vegan friendly. 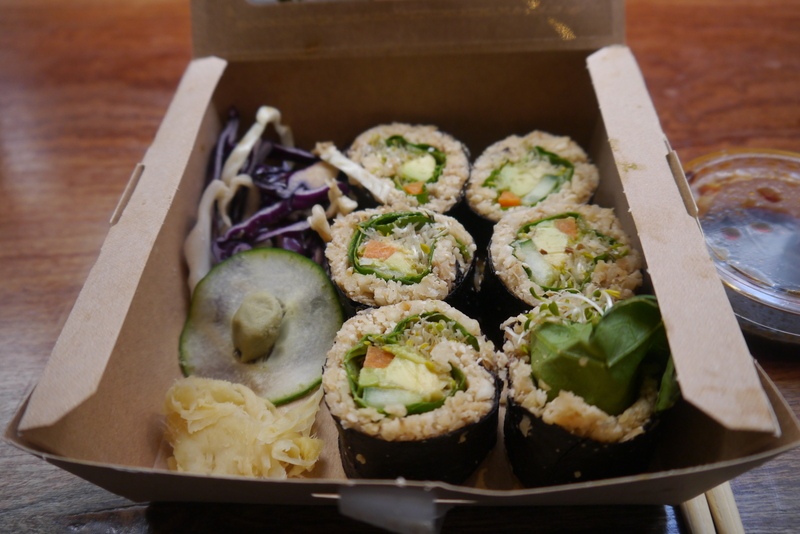 Of all the cafes that had veggie/vegan options, bookworm looked the best and had the most recommendations. It was totally packed and there was a queue to wait (we were there over the holiday weekend). We talked to the woman a little while waiting there and she was very nice but stressed and busy, as might be expected. She was interested in the vegan Happy Cow HK ice cream which would have been perfect there, I hope they followed up and made the call. Post on ice cream to follow. When we were seated and saw the burger bread on someone else’s plate, it looked like it had an egg glaze. No one could tell us. There were several different stories about whether the egg had bread. The burger on the menu, which used that bun, was labelled vegan. Then we found out the bread does have egg, and ordered it on a different bread. It came out on the burger bun with egg. We got it sent back and finally it appeared on toast, by which time the fries were cold, and they were freezer fries and soft and limp. Not very appetising, and I couldn’t finish them. And I love anything potato. The burgers (tofu and bean, we tried both) were okay but nothing special, and after the mix up about the egg neither of us were sure we trusted the cafe knows what a vegan diet does and doesn’t include. Bookworm cafe, and a glimpse of the queue. We paid a small fortune… for this. Left half is bean, right half is tofu. Tiny patties. The staff were far from apologetic, rather they seemed annoyed and the initial friendliness disappeared fast. The whole experience left me pining for the Western service industry, where if this had happened they would have at least omitted the service charge from the bill. I felt very unwilling to pay what the bill came to.The one redeeming feature was the soy latte, which was really good. We heard other people complain about the vegan cake, so we didn’t try that. The mix up would have been more forgivable in an omni restaurant, but not one which labelled its food as vegan. Please take note: if you’re going to say you serve vegan food, you need to know what’s in it, know that it’s vegan, and make sure at least one member of staff knows! Very disappointed and concerned other vegans may visit and not know. 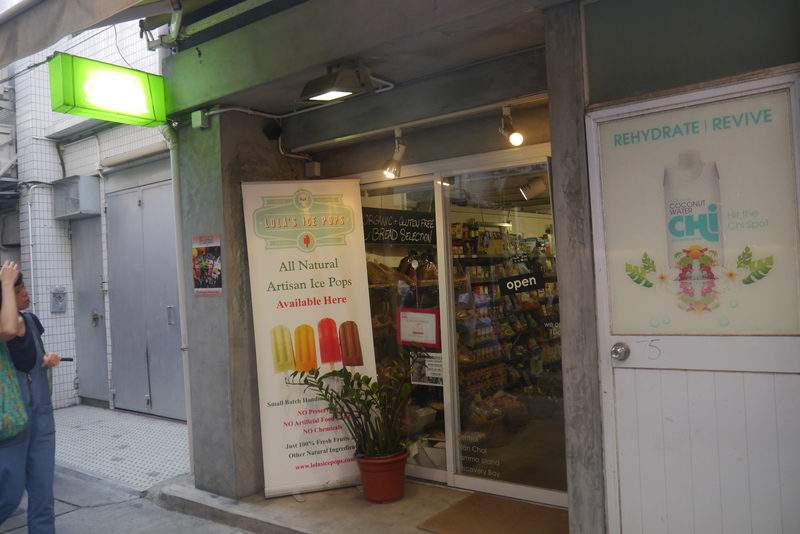 What we absolutely loved though was… The health food shop next door Also known as ‘their sign is too bright to see in the pictures and I can’t remember the name’. But it’s right next door to Bookworm Cafe. This is like a blend of a UK health food shop and an American one. 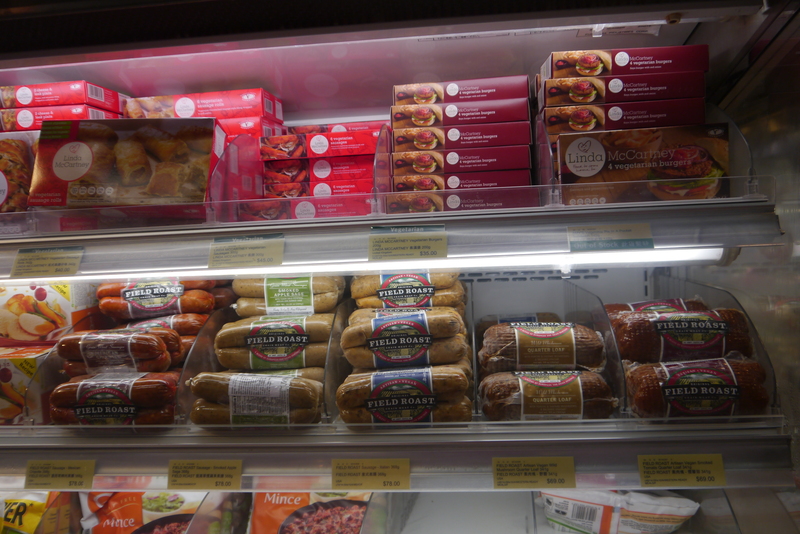 There were so many vegan options I haven’t seen since I moved to Asia, or simply haven’t seen at all like Tofurky. 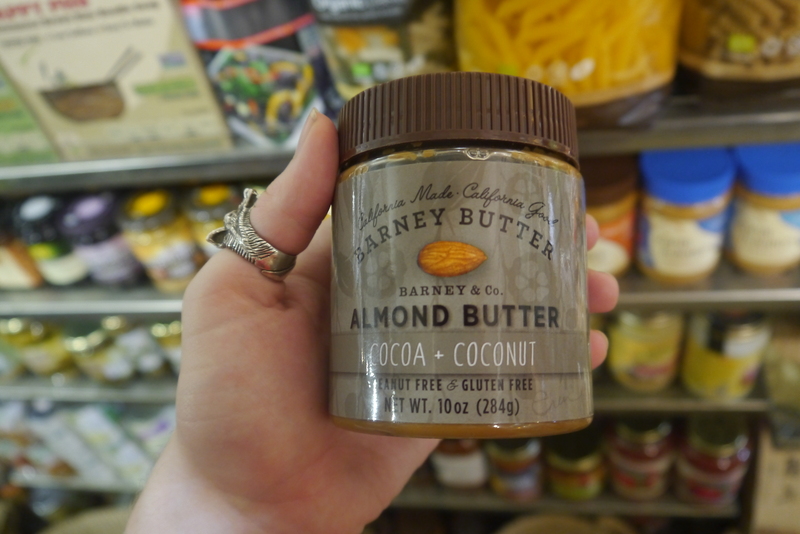 There were just so many things I don’t even know where to start, but needless to say we skipped around the shop like children in a candy store, squealing at each other in excitement. Doesn’t all of that look amazing? 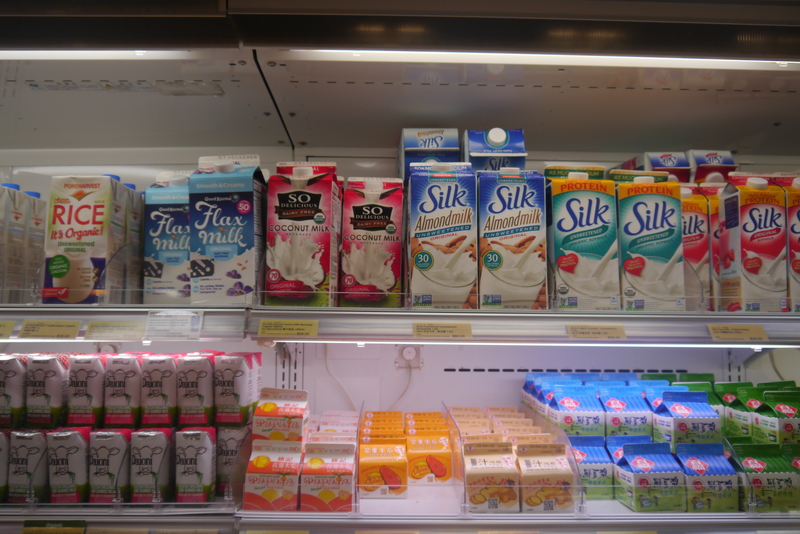 And back on the mainland of Hong Kong, here’s what you can find in City Super: Just look at all of that Silk and Field Roast glory! Actually I’ve never seen Field Roast before, I’m just told it’s good. If we were staying there longer I would have tried some. 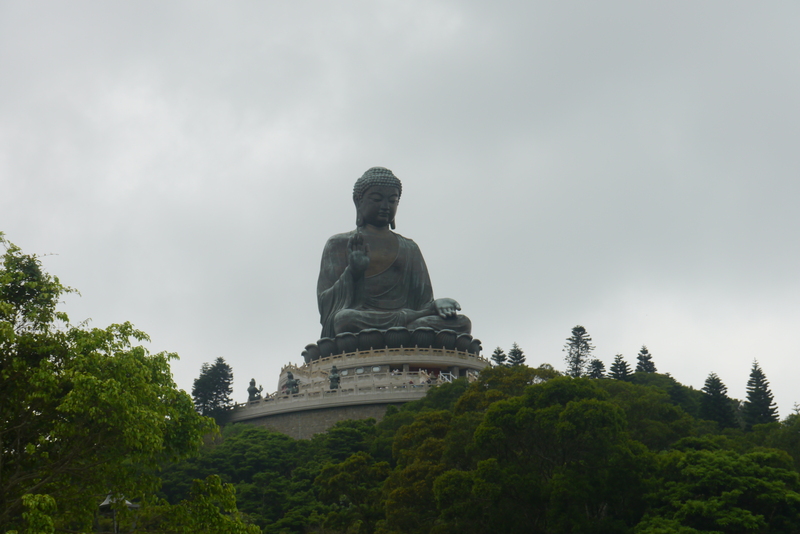 Lantau Island Just a little note to say that, because it’s the island with the big Buddha, most of the places surrounding it are veg friendly. Be careful of the food, though, because again like in Bookworm, the people serving it will give you a different answer to ‘does this contain milk and egg?’ depending on who you ask and how they’re feeling. 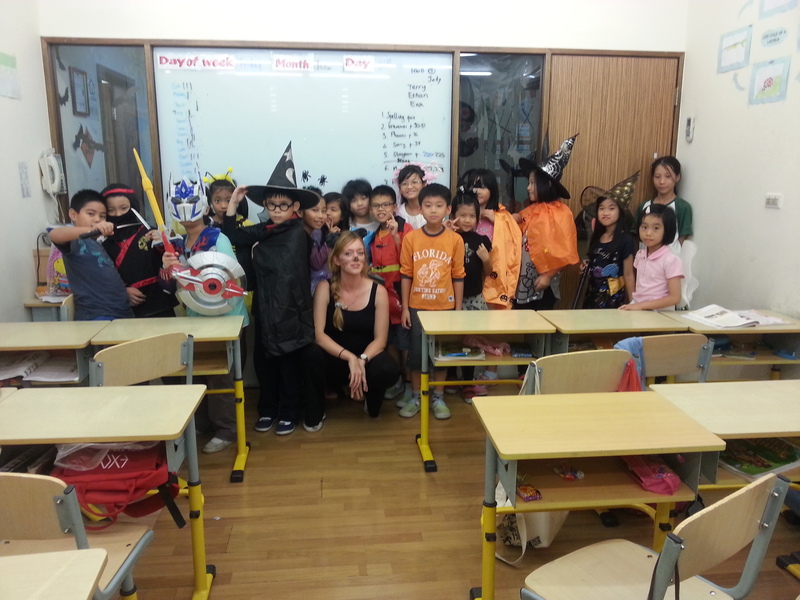 And we were asking in Cantonese, so it wasn’t a language barrier thing. It’s just safer not to trust them: if it looks like it might have egg, don’t eat it. 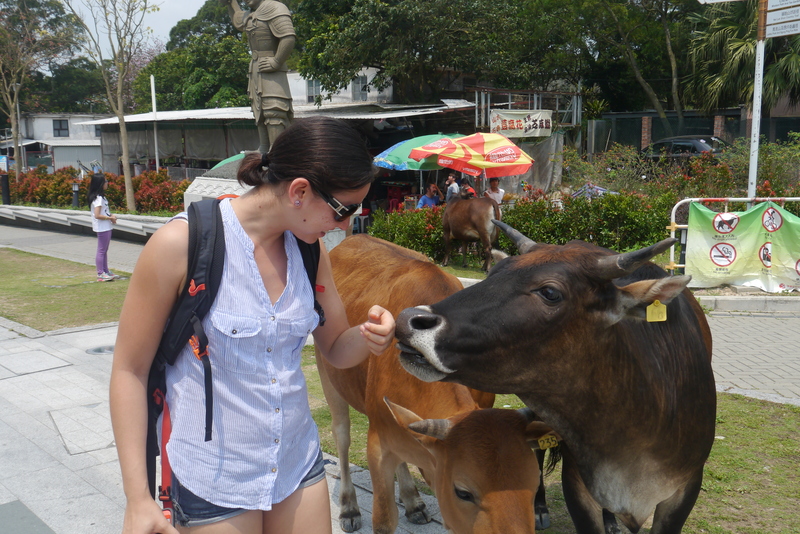 Lantau island is really pretty, though, and has cows freely roaming around that are wild, so it’s worth a visit. Left to right, top to bottom: misc. buffet food, a big buddha, and Josette making new friends. Lantau island is possible to see in about 5 or 6 hours, unless you want to do a hike, so we caught a bus and went there the morning of our flight. The bus was also cheaper, albeit less pretty, than the gondolas. Our flight was late evening and we were left with several hours skulking round an overpriced outlet mall. To get to Lamma island, take a ferry from the Central Harbour area. It’s quick, easy, and reasonably cheap. Then please buy a load of vegan stuff from the shop there, and post it to me. Taiwan vs. Hong Kong, Vegan-off I’m pretty impressed with both places for being vegan in. 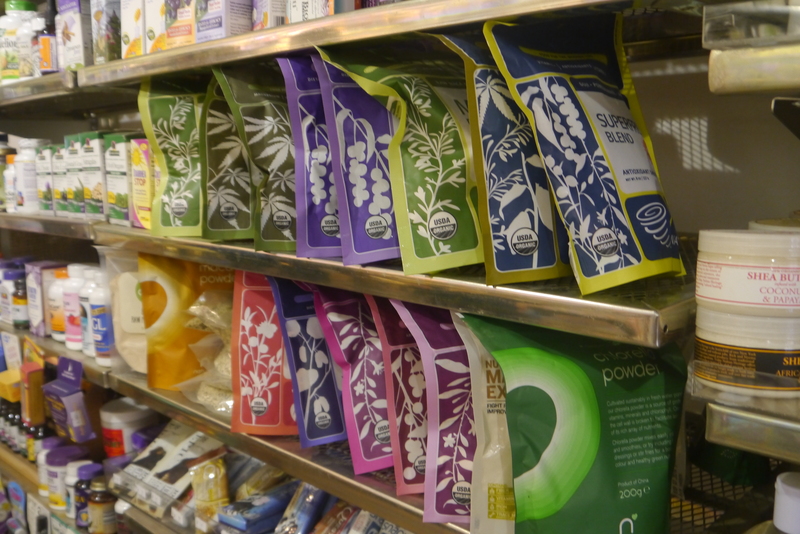 Hong Kong wins for Western Vegan food and produce, Taiwan for local vegan food and availability. Hong Kong wins for main meals if you want to eat out, Taiwan definitely wins for desserts (have you seen my Instagram yet?) 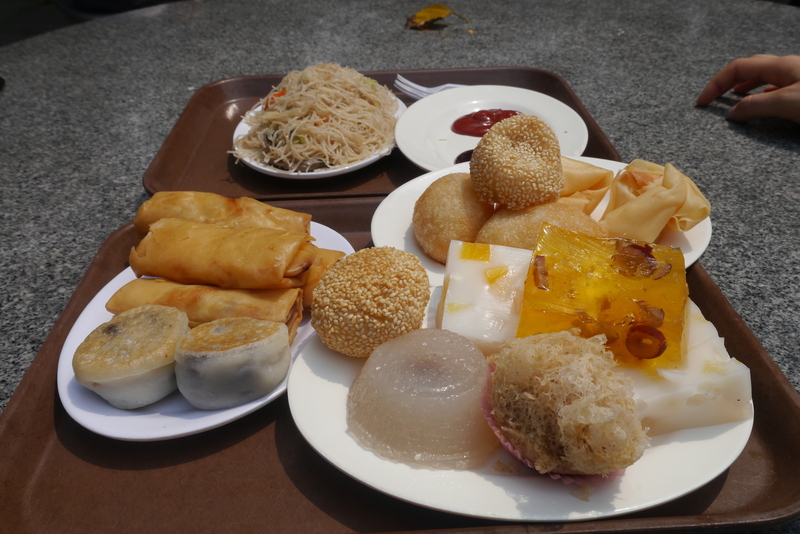 Cost wise, Hong Kong is EXPENSIVE to eat like a Western Vegan. If I lived there, my savings would be gone within the month. Final conclusion though, is that it’s like almost everywhere I’ve been. You’ll hear that it’s bad for vegans, and then you go, and you look, and you ask around, and you find delicious food. Go travel, now. I live here and all my money is spent on food. Is so sad really.